Welcome to the Buffalo State Child Care Center! 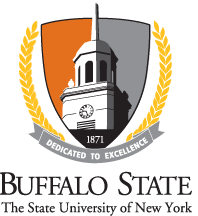 Our mission is to provide quality, affordable child care for the families of Buffalo State students, staff, and faculty, as well as families of other New York State employees and community members. Our center is licensed by the New York Office of Children and Family Services, and is accredited by the National Association for the Education of Young Children (NAEYC). In addition, the Buffalo State Child Care Center was named Program of the Year in 1999 by the Child Care Resource Network ,Inc.
To earn NAEYC Accreditation, Buffalo State Child Care Center conducted an extensive self-study process, evaluating the program and its services against the then NAEYC Early Childhood Program standards and obtained more than 400 related Accreditation Criteria. The program is proud to have received NAEYC Accreditation after an on-site visit by NAEYC Assessors to ensure that the program meets each of the ten program standards. NAEYC-accredited programs are also subject to unannounced visits during their accreditation, which lasts for five years. This center has been recognized for our commitment to reaching the highest professional standards by NAEYC. We are committed to providing a program which embodies developmentally appropriate practices and principles which follow guidelines outlined by NAEYC (National Association for the Education of Young Children). At our center, we provide a safe, predictable environment for each child so they may develop their social, emotional, cognitive and physical abilities. We believe that the activities young children are engaged in should be appropriate for their age, and address their different stages of development. The teaching staff at our center know children learn best when they are involved in a balance of active and quiet play with caring adults who allow a child to grow and mature at his or her own pace. Our staff are all professionals in the early childhood field. Our Teachers have appropriate credentials in early childhood education or a related field. In addition, our staff are required to participate in on-going professional development to keep abreast of current trends in child development and education. In addition to our regular staff, a added benefit of being on campus is the involvement of Buffalo State students in our program. Each semester, we have many field study, internship and work study students volunteering and working here at the center. These students are a vital part of our center, and enable us to maintain lower adult/child ratios in each of the classrooms. Our center is located on the Buffalo State campus. We have an Infant One Program (6 weeks to 12 months); an Infant Two Program (12 months- 18 months); a Jr. Toddler Program (18 months to 2 years); a Sr. Toddler Program (2 years to 3 years); a 3 Year Old Program; a 4 Year Old Program and a Summer School Age Program which runs in the summer for children up to 12 years of age. Our hours of operation are Monday through Friday, 7:30am to 5:30pm. We hope that after visiting our website, you will contact us to schedule a tour. We're all looking forward to meeting you!